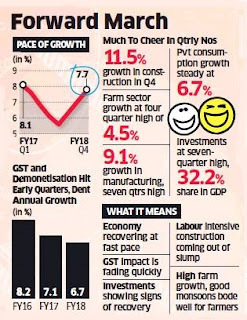 India’s economy grew at its fastest in seven quarters in the January-March period, bolstered by strong performance in construction, manufacturing and public services, pointing to a persistent revival trend and bringing cheer to the government ahead of next year’s general election. The full FY18 growth estimate was revised upward to 6.7% from 6.6% in the second advance estimate released in February. This is in line with the 6.75% growth forecast by the Economic Survey and down from 7.1% in FY17 with the slowdown being attributed to the lingering effect of demonetisation and the rollout of the GST in July last year. Gross domestic product rose a better-than-expected 7.7% in the fourth quarter, retaining India’s ranking as the world’s fastest-growing major economy, outstripping China by nearly a percentage point. The economy grew at the highest rate since September quarter of FY17, ahead of the demonetisation drive that began November 2016. October-December FY18 growth was revised down to 7% from 7.2% estimated earlier. The economy grew 6.1% in the year ago March quarter. Growth measured in GVA terms rose 6.5% in FY18, slower than 7.1% in the previous fiscal. GVA growth in the fourth quarter was the fastest in seven quarters at 7.6%. China’s economy grew 6.8% in the quarter ended March 31. Finance secretary Hasmukh Adhia tweeted that the government’s economic policies were bearing fruit. 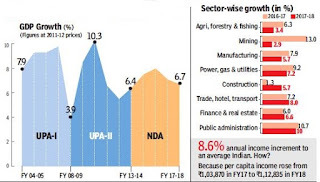 Growth in the agriculture, manufacturing and construction sectors stood at 4.5%, 9.1% and 11.5%, respectively, in the fourth quarter, with construction benefiting from a strong base effect of 3.9% negative growth in the year-earlier period. Trade, hotels, transportation, communication and services grew at 8% during the fiscal compared with 7.2% growth in FY17. The pickup in credit offtake helped financial services grow 6.6%, faster than 6% growth in the previous year. Public administration, defence and other services grew at 10% on an annual basis, marginally lower than 10.7% growth in the previous year. Though private final consumption expenditure growth in FY18 came in at a three-year low of 6.6%, it turned around in the fourth quarter. India Ratings’ chief economist Devendra Kumar Pant expects it to continue in FY19 also with a near-normal monsoon expected and the government’s focus on infrastructure and housing. Gross fixed capital formation rose 14.4% in the fourth quarter, reaching a 32.2% share in GDP, the highest in six quarters. For FY18 it was up 7.6% against 10.1% in FY17.